In a previous post, I detailed the restoration of a Parker Vacumatic. The filler unit on that pen was a 1940s Speedline with a plastic plunger. The pen that I just completed is also a Parker Vacumatic, but with a 1930s Lockdown Filler Unit. The restoration is very much the same as described in the Parker Vacumatic post, with minor differences. The first picture below shows a Vacumatic tool used to extract the filler unit (and reinstall) from the end of the pen. It also shows the lockdown unit next to the old diaphragm after the sac and pellet have been extracted. With Lockdown fillers, be careful to extend the filler before unscrewing the unit to prevent possible irreversible damage to the unit. The new diaphragm is at the bottom. 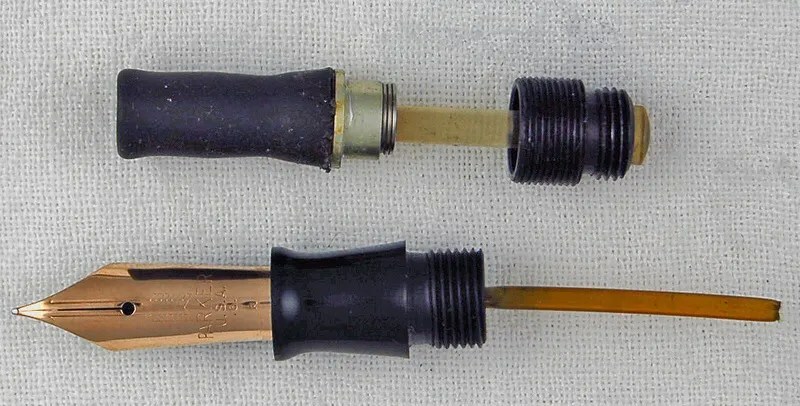 The larger diaphragm is the appropriate replacement for this pen – a 1935 Vacumatic Junior. This was a relatively easy restoration. I removed the nib/section/feed from the barrel and cleaned the barrel out with q-tips and water. There was a lot of dried ink in the barrel as Vacumatics store the ink in the barrel, not in a sac. After cleaning, the barrel retains its original transparency. The breather tube was cleared and cleaned. The cap also had to be scrubbed to free its dried ink. I also polished the nib, clip, and two cap bands. The filler needed to have the new diaphragm attached. As with the speedline fillers, I inverted the sac and pushed the pellet into the filler, followed by attachment of the sac to the filler. I checked the suction and then carefully put the filler back into the barrel, making sure that the diaphragm did not get twisted in the barrel as the filler was screwed back in. After re-insertion of the filler unit I once again checked the suction of the unit before putting the section/feed/nib back into the barrel. The next photo shows the Lockdown Filler extended. To fill the pen, the filler is depressed and held down, then turned slightly to lock it before covering with the blind cap. And finally, the completed pen, posted – a 1935 (date code on barrel) Parker Vacumatic Junior, Double Jewel, Lockdown Filler. I water tested this pen and it fills well. The clarity of the barrel is very good and I will be reluctant to fill it to preserve this. A nice aspect of these pens is the large amount of ink that they hold in their barrels. They can be found in numerous variations of sizes and colors – too many to keep track of. Both of these make them fun to collect and restore. The Parker Vacumatic might be my favorite pen to restore. The filling system is unique and requires some specialized replacement sacs and a few tools unique to the restoration. When completed, they can be very attractive pens. Smaller sizes are often available at reasonable prices, unrestored. Parker Vacumatics were produced by the Parker Pen Company from 1933 to 1948 in the United States. They continued in production in Canada for a while longer. A good reference book devoted entirely to these pens is Parker Vacumatic, by Geoffrey Parker, Dan Zazove, and David Shepherd. The pen I worked on is a Vacumatic Major (standard size) in blue striated color with a medium nib. The date code on the pen indicates it was produced in the second quarter of 1946 in the US (Janesville, WI). The filler is a “speedline” filler, with a plastic plunger, representative of these later Vacumatics, produced in the 1940s. These also had the typical one color gold nib. The only part that needed replacement was the diaphragm. The correct size is a demi size for these Major sized pens. Diaphragms also come in a larger size for some large sized Vacumatics such as the Maxima. I cleaned up all of the usable parts first. It is extremely important to clean the inside of the barrel on these as often times the old diaphragms may have adhered to the barrel, and the repair will be unsuccessful if this is not removed. Be very careful doing this as the inside of the barrel can scratch easily and one of the nice effects of these pens is the transparency of the barrel. The nib, feed, section, and breather tube were cleaned in the ultrasonic cleaner and the nib with some Simichrome and a dremel. The cap had the usual large amount of dried ink and cleaned up after several swabs with q-tips and water. Finally, the cap, barrel, and blind cap were polished to a shiny glow and the transparency on the barrel is complete. The diaphragm attachment is the tricky part of the restoration, but once you do it a few times, it is fairly simple. From the picture below you can see that the old diaphragm has been detached from the filler unit. However, a pellet remains in the pellet holder at the end of the filler. This must be taken out of the filler unit before the new diaphragm with the new pellet can be inserted. There are many different techniques for removing the pellet. However you do so, it is extremely important not to damage the hole to the pellet holder. I use the thin tip of an x-acto knife to pick at the pellet and cut it to pieces. Eventually these pieces fall out of the holder and the filler is now ready for the new pellet/diaphragm. New diaphragms come with the pellet in the tip and ready to go. First the diaphragm needs to be folded back against itself until the open end reaches the pellet end. This takes some time and patience. Once this is achieved, the pellet pusher tool is placed in the diaphragm against the pellet and the pellet is pushed into the hole in the filler. Now that the diaphragm is attached to the filler the diaphragm is further folded onto the filler unit. It needs to be placed onto the filler until such time as when the plunger is pushed the filler extends to the edge of the diaphragm. At this point, trim off the excess sac so that it covers the filler to the edge as shown in the second picture below. Here are the completed filler unit and nib assembly with breather tube after restoration. The only non-original part was the new diaphragm/pellet. After the filler unit and nib assembly have been completed, the filler is screwed in to the top of the barrel. One must be careful that the diaphragm does not get twisted or turned when doing this. It is a good idea to look into the nib end of the barrel after the filler has been inserted to see that everything is straight. If not, it must be unscrewed and reinserted. Next, the nib assembly is screwed back into the barrel. The completed pen is below. The dates on the photo refer to the years this particular pen was in production. As stated above, the date code of .6. indicates this pen was produced around the Spring of 1946. The nib has the same code stamped on it, indicating to me that it is the original. Several other Parker pens used the vacumatic filling systems including the Parker 51 and later Duofolds. In future posts, I will photograph some of these repairs. Just when you think you know enough about fountain pens to make you dangerous in casual conversation, another alley opens up and a new type of pen emerges. I had heard of stylographic pens and had seen a few pictures here and there, but considered them inferior to standard nibbed fountain pens. Last night I restored a JUCO “Independent” Stylo. My opinions changed after I completed the pen and tried it out. First, a picture of the pen after I took it apart. Note that there are a few parts that are not found on most fountain pens. The nib almost looks like a rollerball nib and the bottom right elongated needle fits inside this nib to control the flow of ink. The black hard rubber barrel and cap are identical to lever fillers of the day. The only departure is the section, nib and and control needle. There is no feed as the nib screws directly into the section. As you can see, the sac had hardened and needed to be replaced by a size 18 sac. I cleaned out the section, nib and ink control using an ultrasonic cleaner. I also spent quite some time cleaning out the cap, which had an abnormally high concentration of purple ink caked into it. Below is a close up of the imprint, which appears on the cap, not the barrel. Inside the heart on the left is “JU & Co, which is short for Jacob Ullrich and Company. JUCO, was a fountain and stylographic pen maker in New York City in the late 1800s and until the 1920s. Jacob Ullrich was a resident of Hoboken, NJ. Below is a picture of the completed pen. The clip and lever have lost their gold plating, but the chasing on the black hard rubber is well preserved. I would estimate this as an early to mid 1920s pen as it is a lever filler and many of the JUCO stylographic pens I have seen are eyedroppers and date to the 1905 to 1915 time period. This pen writes much like a modern day roller ball with a fine line. There is none of the shading and expressiveness of a standard fountain pen nib, but if one is looking for a rollerball type experience with a vintage feel, this is the pen. I have filled mine up with Waterman Ink (Florida Blue) and it will be a good pen for math and accounting in the office. Stylographic pens were invented in 1875 in Canada by MacKinnon and appeared in the US shortly thereafter. 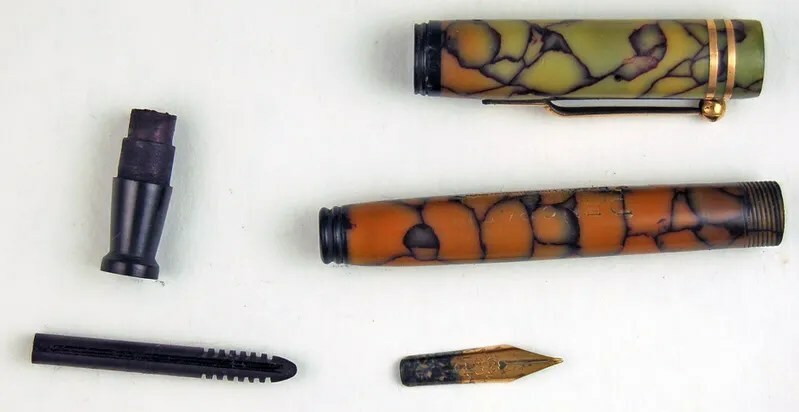 Their popularity was then quickly dashed by the emergence of nibbed pens, but they did remain in production on a limited basis for many years. One of the most noted producers in the United States was Inkograph and they were even more popular in England. If you are looking for a pen with some historical significance, with practical use, ease of repair (assuming the needle is in usable condition), and a unique niche in the world of pens, a Stylo would be a good choice. Last week’s post – Belmont/Rexall and Yankee Cousins – was about two pens that were nearly identical, but made with different imprints; one for a Kraker Company and one for Rexall Stores. This week follows a similar theme. The pen restored this week is a Pencraft, made by the Michael George Company of Libertyville, Illinois. The Michael George Company was a Company owned by George M. Kraker, a man discussed in many of the posts in this blog. As you may recall, Kraker left Grand Haven, Michigan in 1929 and moved to Libertyville. I am not sure how long he was in Libertyville, but he did show up in Chicago by 1938. In Libertyville, he produced pens for Rexall and under his own Pencraft, Dixie and possibly other names. This pen came to me in typically discolored condition. As you can see, the pen is a typical lever filler that needed to be cleaned from top to bottom. Interestingly, this one came with no lever on the inside. Someone had previously taken it apart, but had not finished the restoration. I cleaned the nib with simichrome and an ultrasonic cleaner and also scraped the section to remove remnants of the old sac. I inserted a new j-bar and size 16 sac and the resulting pen is shown below. Below is the imprint showing the Pencraft and Libertyville, Ill. location. And the Pencraft “30” 14K nib. Finally, this pen above the pen restored in my February 7 post – Rexall Monogram – in which I surmised the Monogram pen below (sold at Rexall Stores) was made by Kraker, prior to the contract with Rexall expiring. Based on the similarity of the two pens, I may have been on the right track. To me, restoration is the resurrection of an old, often neglected, pen and repairing it to as close to its original condition as possible. I attempt to use original parts in all restoration and will always indicate whether a pen has been restored using any substitute parts. I believe in polishing pens to make them look closer to their original condition, but not in recoloring a writing instrument. I have a large inventory of previously restored pens that I will post from time to time, but my goal is to follow current restoration projects. I am NOT a professional pen technician/restorer/craftsman or historian. I do NOT sell pens or services. I am not publishing this to further a business. I welcome your use of the information and it is for your enjoyment. I do this only as a hobby, and do make mistakes from time to time. Should one be interested in professional restoration advice or service, some of the links on this page would be a good place to start. This discourse is for entertainment purposes only and I hope the reader will enjoy some of the information shared. Addendum ~ After researching, restoring , and writing close to 200 posts as I write this in November of 2012, it has come to my attention that some readers are pasting large portions of this blog into their own blogs, making my research and photos appear to be their own. I do not mind that you link to my blog, but do not cut and paste my information and photos to your websites in its entirety. This is deceptive at least, and theft at most.